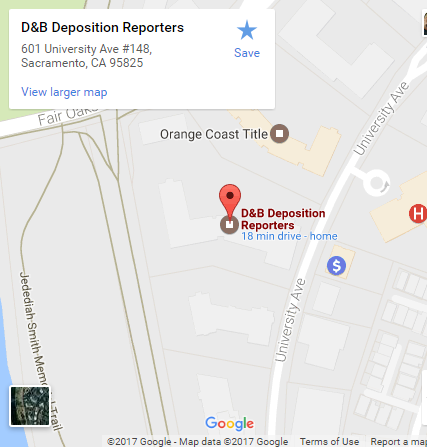 D&B Deposition Reporters has been a locally owned and operated court reporting company for over 25 years in the Sacramento area. We send only experienced and personally trusted court reporters to your jobs. We cover depositions as well as trials, court hearings, arbitrations, and mediations. We specialize in complex litigation involving technical matters, mold, employment, medical, health care law, and legal malpractice. You can depend on us to deliver accurate transcripts in a timely manner. We offer the latest in reporting technology to save you time and to make your job easier. Beginning April 1, 2015, D&B is pleased to announce its association with Vine, McKinnon & Hall, Certified Shorthand Reporters, another long-time, locally owned and operated company in the Sacramento area!